If the patient suffers from an accident or injury to the teeth please contact our office or your general dentist immediately. Injuries from blows to the mouth, teeth or jaws may cause harm that require special attention. Examples of these types of emergencies include chipped , broken, or displaced teeth, severe cuts to the lips or gums, swelling, and trauma to the jaws that cause pain when opening the mouth or an inability to open the mouth. Other signs or symptoms that should be evaluated are changes in the color of the teeth or the sensation of a single tooth (especially changes to temperature such as hot or cold sensitivity), or severe discomfort that impairs the patient’s ability to perform normal actvities such as going to school or work. A. Archwire: The archwire is tied to all of the brackets and creates force to move teeth into proper alignment. B. 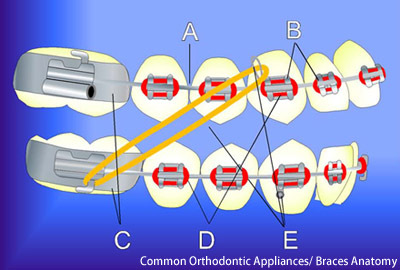 Brackets: Brackets are connected to the bands, or directly bonded on the teeth, and hold the archwire in place. C. Metal Band: The band is the cemented ring of metal which wraps around the tooth. D. Ligature: The archwire is held to each bracket with a ligature, which can be either a tiny elastic or a twisted wire. E. Hooks and Elastics: Elastic hooks are used for the attachment of rubber bands, which help move teeth toward their final position.